My all time favorite breakfast is granola with Greek yogurt. I love to have it with fresh fruits and drizzle of honey. I have been trying few different brands for readymade granola packets, the grocery aisles are overflowing with all type of granolas but every home cook loves to create their own version of simple and delicious granola that can be memorized and made from heart. Homemade granola can be a healthy, comforting, and delicious treat anytime. Lately I have realized most of the store-bought stuff is high in sugar, contains unhealthy fats, and is packed full of fillers and unnecessary ingredients. 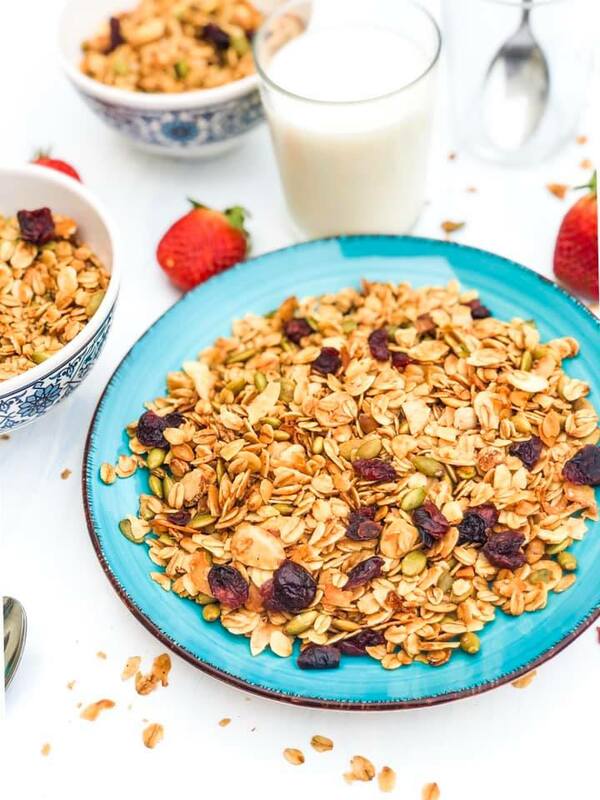 So instead of buying from market why not whipping up your own granola at home, super easy, quick and allows you to control the amount of sweetener and quality of ingredients, while also changing things up and adding up your kinda flavors. One thing is for sure once you tried homemade granola you will never go back to store-bought. 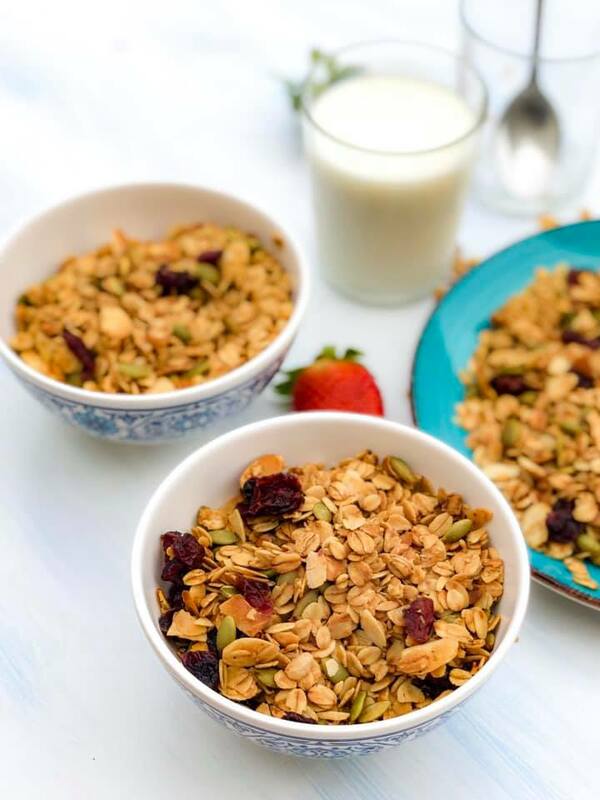 This granola Recipe is so good and healthy, since it’s made with whole grains, unrefined oil and naturally sweetened. Mmm my kitchen smells so good with it. 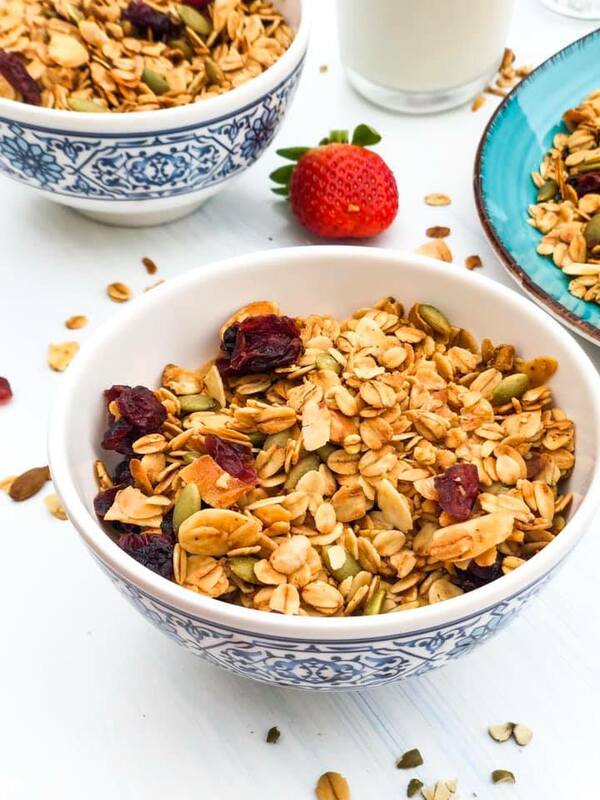 This is simple and basic granola recipe, you can play around with the any ingredients and spice you like and create your own favorite granola. You can preserve this freshly baked granola in freezer for long time, take out and bring it to room temperature before serving. 1. Combine oats with almonds, coconut flakes, cinnamon powder and sunflower seeds. 2. Melt coconut oil over low heat, add honey, mix well over heat for 2 minutes, remove from heat, add oats, mix well. 3. Spread mixture into oven tray; bake in preheated oven at 160 degree for 20 minutes or until golden in color. 4. Cool it, add dried cherry and store in tightly close jar. 5. Keep it in fridge or freezer; bring it room temperature before serving. Whole oats are full of good-for-you fiber, high in protein, and contain vitamins and minerals like iro and magnesium. I like to use coconut oil because it’s full of nutrients and adds a really nice light flavor to the granola, but you can use any healthy oil you like the taste of. To sweeten, I prefer maple syrup or raw organic honey.